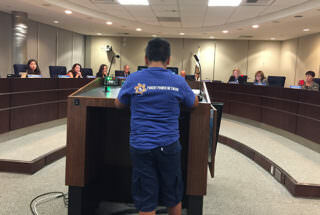 Sixth-grade student from South LA Semaias Muralles speaking at an ESSA hearing in Sacramento before the state Board of Education. California’s plan to comply with federal education law comes up short in nine key areas and is destined to have portions rejected, according to the influential California advocacy organization Children Now. Based on federal feedback to states that have already submitted their plans, the Oakland-based nonprofit, nonpartisan education advocacy organization has sent letters to the state Board of Education showing areas where California’s draft 100-page plan doesn’t meet the requirements of the federal law or falls short in supporting California’s most vulnerable children. The Every Student Succeeds Act, or ESSA, was enacted by President Barack Obama to give states more local control and move away from a singular emphasis on test scores. California must submit its plan to the U.S. Department of Education on Sept. 18. Bellwether Education Partners released its evaluation of California’s ESSA plan last week. It has conducted a peer review of the state’s draft plan and issued low grades for how California proposes to measure student proficiency and growth and to identify schools and students most in need of support. In addition, Children Now has highlighted specific areas where they are concerned California won’t adhere to the federal law, including an inability to determine whether achievement gaps are closing, to measure individual student growth, and to fully identify low-performing schools. One of the problems is the approach the state is using with its new California School Dashboard that measures several indicators of how well a school is doing. “In order to identify low-performing schools, the state has to combine these indicators that weren’t set up so that they could be effectively combined,” Manwaring said. Much to the chagrin of some advocacy groups, the state Board of Education opted not to rank schools by a single number or a grade, as some other states do and as was done in the past through California’s Academic Performance Index. The state board has taken a bare-bones approach to its ESSA plan, viewing it as a compliance document, Manwaring said. But Education Secretary Betsy DeVos’ department has surprised some states by taking a hardline approach and sending back some plans for not being ambitious enough. But just because something is not included in the plan, it doesn’t mean the state isn’t doing it, state education officials have countered. So what happens if the feds reject California’s plan? In short, needy kids won’t be getting the help they need anytime soon. After the state submits its plan by Sept. 18, California and U.S. education officials will have a two-hour closed door meeting to discuss the plan and any issues the federal peer reviewers had. Then the feds will provide formal feedback to the state. Then, if California decides to stick to their guns about their plan, there could be many years of back and forth between the feds and the state, which has battled with federal officials before over science tests, Manwaring said. The result could be a delay in an authentic accountability system and getting resources to schools that need it most, he said. 1 — Are achievement gaps closing? “The biggest issue that this plan faces is it’s just simply not measuring achievement gaps very well,” Manwaring said. The state says low-performing schools will have seven years to improve and meet goals, but the state is leaving it up to local districts to determine whether they’re making progress and how they will report progress is being made. For example, the state has set a goal of a 90 percent graduation rate, but the plan does not identify how the state will track this goal for sub groups like Latinos or African-Americans and how schools are progressing toward the goal. Children Now says federal law requires that states look at achievement gaps among sub groups and requires faster improvement for groups and schools farthest behind. Closing achievement gaps is a goal of the state’s Local Control Funding Formula, which gives more money to districts for English learners, foster youth, and low-income students. But it is unclear if districts are actually spending the money on programs for these targeted groups, and three years in, achievement gaps have not decreased, Manwaring said. 2 — It doesn’t measure student growth, unlike 17 plans submitted so far. So far, California’s plan does not measure individual student growth over time. Instead, it measures school growth year-to-year, which is based on different cohorts. Third-grade test scores at a school could improve from one year to the next because a particular class of students is more advanced than the previous year’s third-graders. State Board of Education President Michael Kirst told the LA Times that a student-level growth metric is not required by the law. Seventeen states that have submitted their plans measure individual student growth, according to Children Now. 3 — It doesn’t identify the bottom 5 percent of schools. Under the federal law, states are required to identify the bottom 5 percent of schools and explain how they will provide additional resources, called interventions, to help these schools improve. In its plan, California will identify these schools based on its California School Dashboard, which gives schools a color in different indicators, red being the lowest and blue being the highest. California will consider schools that have all reds or reds and one orange as low-performing schools, but that will not be enough to identify the entire bottom 5 percent. The state Board of Education has said it will submit a supplemental document to the federal government that will include how it will identify the entire bottom 5 percent. “That’s a key element of this new plan, and they simply said we won’t even try it until January,” Manwaring said. 4 — What does it take to improve, and how much progress do you have to make to graduate from intervention? The answer, in this plan, is none, Manwaring said. To fall into the bottom 5 percent of schools, a school has to be declining. To move out of the bottom 5 percent, all a school will likely have to do is stop declining, Manwaring said, even if that school still has horrible outcomes. “It’s an exceedingly low bar for what our expectations for school turnaround are,” Manwaring said. 5 — What do you do if you’re a small school? There are many small elementary schools that will have only one color score — for their suspension rates — because standardized tests aren’t taken until third grade, according to Children Now. Some charter and rural schools with odd grade configurations will not have enough students to record results. They need 30 students to report a group. 6 — Some kids are just dropped out altogether. Students who attend alternative high schools won’t count in the accountability system. Alternative high schools are independent study programs for students who are at risk of dropping out or short of credits. Alternative schools are not part of the state accountability system and are not included in districts’ graduation and dropout rates. “You’ve taken the most at-risk kids and said they don’t count,” Manwaring said, something he believes the federal government will flag. 7 — It doesn’t assess 11th-graders’ proficiency. Instead of high schools being accountable for 11th-grade assessments (the only year the tests are taken in high school), as required by the federal law, California will substitute its college and career readiness indicator that it is developing as part of its dashboard, which combines 11th-grade test scores with AP test scores, whether students are on track to meet A-G requirements that make them eligible for the state’s public universities, and career technical course completion. Measuring college and career readiness is a good idea, but how California opted to do this didn’t take into account the requirements of federal law, Manwaring said. 8 — It lacks a standard definition of English learner reclassification. Long-term English learners, who are English learners who have not mastered the language after six years, are considered to be making progress even if they don’t have improved scores on the CELDT (California English Language Development Test), a test that determines English proficiency. “It is as though California is saying, ‘It’s OK for these kids not to make progress, to stagnant there and not get reclassified,’” Manwaring said. He said the California plan writes around federal requirements for a transparent reclassification process. 9 — The bar for test scores is too low. The standards that the state sets for English and math tests are too low and should not be tolerated, Manwaring said. Manwaring said an issue with using the colors in the dashboard is there is a “massive range” in the colors. Two schools could receive a yellow — the middle grade — for test scores, but students at one school could be performing above grade level while students at the other school are performing three years behind grade level. The shared color suggests that schools are similar, but they might not be, Manwaring said.